Your moving truck may be gone, but moving day isn’t over. Anyone who’s survived a move knows that half the struggle of moving comes in the days that follow. There’s unpacking, setting up your electronics, assembling furniture, finding your new favorite grocery store, even just finding a good spot for dinner your first night in your new place. And if you’re moving in Chicago, this is doubly difficult. How do you find the local favorites in the third-largest city in America? The answer is Yelp Chicago. There’s a high chance that if you are, at some point during your move, reassembling furniture, you’re going to break something. And while duct tape can make things transportable on moving day, you may not want to use it permanently. You’ll need to find a hardware store to get those little fix-it items and accessories that make a house a home. According to Yelp Chicago, that store is Gillman Ace Hardware. Reviews cite it as having friendly, helpful owners, excellent selection, and fair prices. Grab a toolkit, some nails for hanging photos, and even some duct tape. After a long day of lifting boxes, scrambling around furniture, and trying to remember where you packed your phone charger, going out might not be an option. So for moving day, order in for dinner. Yelp Chicago knows the best place to order in from is Silli Kori. Reviews list it as a tasty, affordable option for takeout with an Asian-fusion selection. Order in or get takeout so you can grab a bite while unpacking those boxes. When you’ve been trapped in your house unpacking for a full day, it’s time to get out and explore your new home. And you’re living in Chicago now, so it’s time to dive into deep dish. Yelp Chicago recommends Lou Malnati’s, a Chicago classic with over 5,000 reviews. While Yelp recommends the River North location, you’ll also find locations in South Loop, the Near North Side, Wicker Park, Lincoln Park, the Near West Side, and throughout the larger Chicago area. Perfect for grabbing a bite out in the neighborhood and getting a breather from your moving woes. If you want to buy in bulk, you go to Costco. And if you want to go to Costco in Chicago, Yelp Chicago recommends the Ashland Costco. While you can usually assume all Costcos are the same, Yelp reviewers call out this one in particular for their customer service and food court quality (something reviews for the other Chicago Costco locations lack). Grab a year’s supply of toilet paper, ten pounds of frozen chicken, and all your bulk essentials to get your home set up post-move. Even if you brought all your furniture from your old place to your new home, you probably realized shortly after move-in that you still need something. A new side table, a lamp to compliment your bedroom setup, perhaps even a couch because your old one tragically just won’t work in its new space. Enter Furniture Outlet, the top-rated furniture store on Yelp Chicago. The furniture quality and price are well worth it, earning them a top spot on Yelp Chicago. In the process of moving, you find plenty of things you don’t necessarily need. But when you need to move on a tight schedule, you don’t have time to declutter your entire home before putting it into boxes. That’s why so many turn to home organizers after they move, including the top-rated Chicago Organizer. 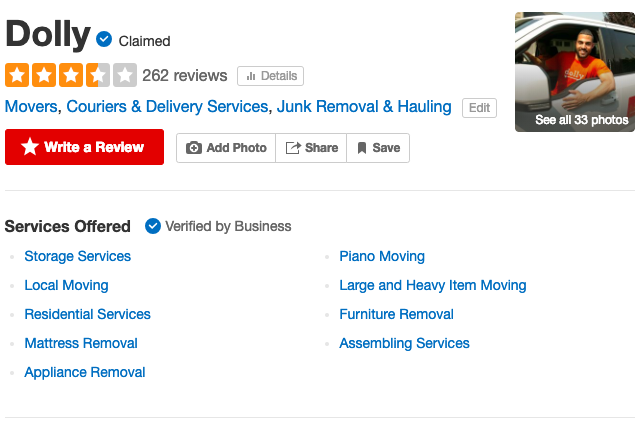 They offer tailored services specific to folks who have just moved into a new home, and according to Yelp Chicago, their organizing and decluttering skills are unbeatable. From moving day help to on-demand furniture delivery, Dolly’s got you covered. Dolly can help with anything that requires a truck and muscle, whenever you need it. We’ll bring home your new mattress, take your unwanted items to a donation center, and even help rearrange furniture in your new place. Whatever you need heavy lifting help for, Dolly can make it happen. There’s a lot to know and see when living in Chicago, especially if you’re new to Chicago. But with these resources, moving day (and even moving week) can be easier, setting you up for a great start in Chicago.